We all know how annoying it is to cross a cable on the wrong row. Although I teach how to fix that in Advanced Knitting Fixes, it’s so much nicer to avoid the mistake! Sometimes we come back to a project after a while and we don’t remember what row the cable cross was on. #1 – Where the cable crosses, it creates a hole. Insert a dpn through the hole. 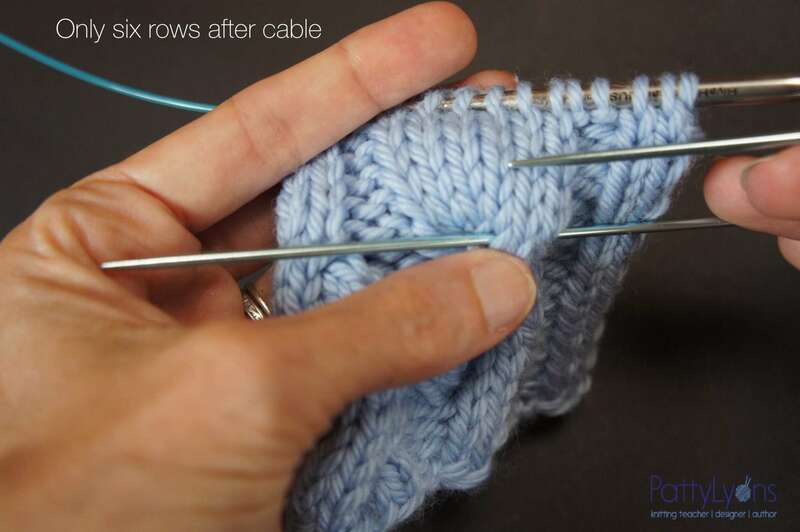 #2 – Put the tip of the dpn through the center of the last stitch on the cable on the cross row. #3 – Repeat with a second dpn at the top of the cable cross. #4 – Now you can just count the rows between the dpns. The cable crosses every 8th row! Sometimes we are in the middle of knitting and forget what row we’re on . . . is it time for the cable cross? #1 Insert dpn in the last cable cross. For more cable tricks enjoy $20 off my Craftsy class Explorations in Cables.